Cool and timeless, Byron Bay features a monochromatic geometric design against a deep black base. The support Byron Bay brings means you are looking good and feeling good too. The new Kiso Valley range features an exclusive graphic palm print in grey and black tones on a clean white base. With an all new red Fantasie branded tab. Marseille is sophisticated and elegant showcasing a boho luxe crochet bardot sleeve in a Twilight blue colour. Styling is contemporary, with waterfall frills and on-trend cold shoulder multi-way sleeves. 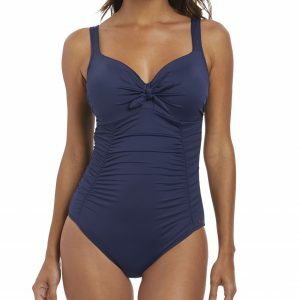 Marseille is sophisticated and elegant, with a fantastic fitting swimsuit in Twilight Navy. This style is absolutely flattering on almost all body shapes with the help of light control panels to tone and firm the tummy! Elevate pool side style with this botanic bamboo inspired collection. Exclusive design by Fantasie, Palawan features a photographic print that pops against a black base in warm sunset shades and lush leafy greens. 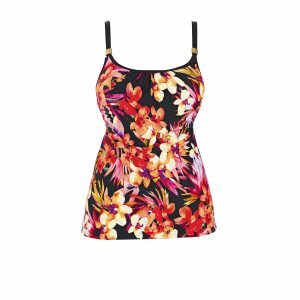 Transport yourself to the tropics with Paradise Bay’s Italian-designed print, exclusively created for Fantasie Swim. Azure ocean blues come together with yellow and palm green highlights on a bold black base. Echo Beach features a linear geometric Aztec print inspired by traditional craftsmanship. Colours are bold, and include purples, pinks, yellows and blues, all of which pop against a contrasting black base.